A particle of liquid have more order than that of a gas, or the gas molecule is more disorder. A classroom with teacher is ordered. A classroom without a teacher is more disorder,or simply the entropy is more. 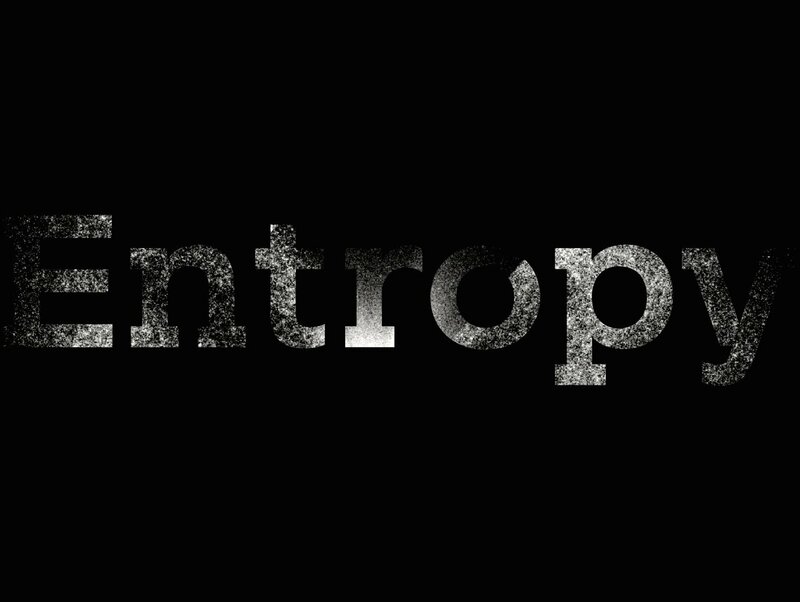 There is no exact physical significance for the term entropy,how ever there are some meaning for this 'disorderness'. Entropy being the measure of disorderness,it indirectly states the cause for order. Its like,if you are the measure of violence over a region,probably you are the reason for it to happen. Entropy is mainly associated with heat transfer in a system. So connecting the order and heat,we define entropy as the thermal inertia or heat inertia. The common inertia is the cause for motion. Moment of inertia is the cause for rotation. Similarly, Entropy is the cause for Heat change. But our entire universe is a heat system. Right? Starts born,stars die,other bodies bursts, universe expands. What does entropy have to do with all these? There are reversible and irreversible processes. Just as the names suggests,one can be reversed and the other can't. But why am i telling this? Checking your vocabulary? :P Nop! I need to make a statement that, "All the natural processes I the universe is irreversible. It can't be undone"
Burning a wooden piece, making some food, digestion, weaving some clothe,electricity,giving birth,growing,dying and almost all the natural processes are irreversible. We can also say,almost all the reversible processes are ideal in nature or it isn't a real one. We just use it to study. From the studies of efficiency of an engine, scientists and engineers have found that, An engine is also a thing which does an irreversible process. Efficiency,as the word suggests is the quality or capability of something to do something efficient? For an engine,it defines how perfect it can work. There is ideal engine and real engine. Ideal engine exists only in text books for the purpose of studying as it is ideal one and real engines exists in reality. However ideal engine (which exists only in books,which are said to be the perfect role models :P ) is the more efficient than a real engine. It is like, a 1 litre bottle can never measure 1 litre,as there will always be a manufacturing error might be ranging from microscopic level to nanoscopic or even picoscopic or so on. The value of this difference always a positive one. Why? For every process we takes some energy,use some and leaves the remaining. The difference between taken energy and leftover energy will be positive right? Because that is the one which we used to does the work! For every natural processes this leftover energy,is dumping onto our surroundings,globally to the nature or.... Universally to the universe. Hence for every natural processes little little such energies will gets dumped. 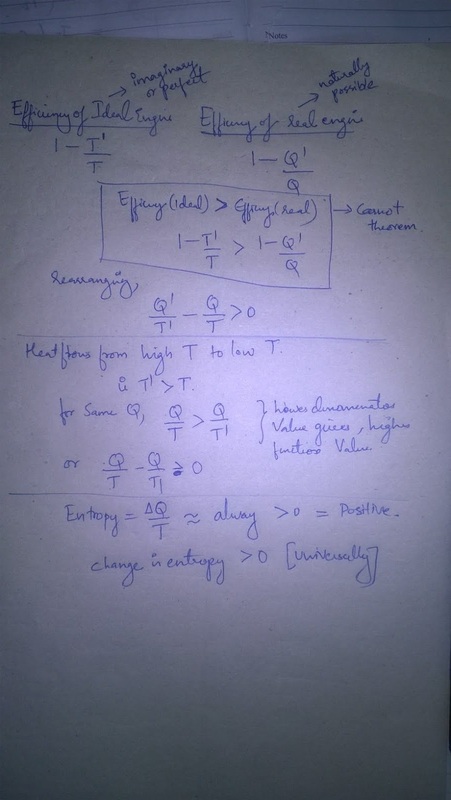 [ratio of 'change in Q' to T is the relation for entropy]. As the T<T' and Q/T is entropy... Lower denominator produces higher entropy (for the same Q) or entropy is positive for every natural processes. Which means entropy is being increased always, from burning of a wooden price to burning of a star,which again means the entropy of universe is always increasing. What does it have to do with us? Do it bothers me? Why should I care? But why do I have to care? Does it affects me? Absolutely no!!!! Entropy is the measure of disorderness or it is the cause for heat exchange. We can also tell an increment in entropy will also suggests,somewhere in the universe some heat is being transferred from a high temperature to lower one. Well,heat can only go like that unless some special works (refrigeration) are done. But still what does it costs? It costs nothing,but engulfs everything. Universe is expanding,making more and more space for heat to spread. And Entropy which is always increasing and increasing, reduces the total amount of higher temperature region itself. At a certain point of time (after millions of billions of earth years) universe will ask for almost every energy source for this entropy to go on increasing along with expanding universe. It is thought to be a fate of our universe,we don't know yet. The loss of available energy is equivalent to gain in entropy. As entropy is gaining,available energy reduces which in turn makes universe a desert where everything is unique as sand,except there won't be anything to watch it. At the maximal entropy state all the physical variables,the temperature,pressure,composition. All will be uniquely distributed. And it will be impossible to differentiate between two points in the universe. But it never goes beyond 0 kelvin. That is, whatever it matters,even if the universe is at the verge of a heat death,the lowest possible temperature is Zero kelvin. It will never go negative. Why it is still limited at its own death? Why universe isn't free even at its death? Why can't the universe have a negative kelvin scale temperature? I have already told that the efficiency of an ideal engine is [ 1-T'/T ] and no other engine (all other engines are real ones) have more efficiency than this one. One of my fellow readers have asked a silly doubt,"this is all about engines right?" Yes,but an engine means a thermodynamic observational system. This phrase doesn't digest for common people that's why I used 'engine',and it not only represent an engine of a machine or an automobile but every heat taking - giving systems. What if then, the temperature becomes negative? 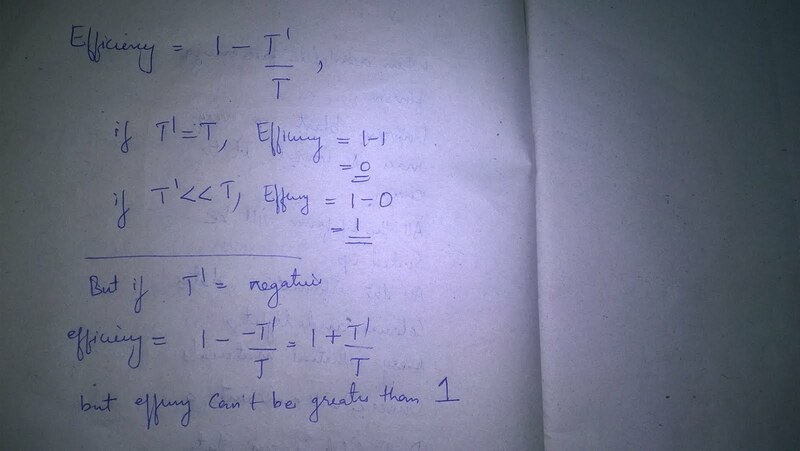 (see the image), the efficiency is greater than 1. We just said, 1 is the maximum value and that is too ideal... How can any system ever get more efficient than 1? How can one be more legendious than legend? How can you be more yourself than yourself? How can water be more watery? So the concept contradicts reality,hence the assumed thing is not real or generally,the negative temperature in kelvin scale is impossible. This doesn't mean negative temperatures are impossible,after all its just temperature and positiveness and negativeness are what we attributed to them. And this is only valid in kelvin scale ,not in Celsius or Fahrenheit scale. Kelvin is the general scale,so that's how it become more important. But what if,there is a particular case in which negative kelvin exists? If the subsystem of a main system is considered isolated from it,the nucleus can have a negative temperature. That's what Ramsey in 1956 put forwarded. The negative temperature on a whole system is an invalid idea,where as for certain cases,its possible. Ramsey's experiments shows that possibility. For normal purposes only the positive temperatures are possible. As it is not a significant thing in normal physical universe,I am not going further. Temperature refers to the amount of kinetic energy possessed by the atoms, molecules or the particles involved. So , Zero temperature means a state in which the involved particles have no effective relative motion. In that case Negative temperature is just a false idea. And also there is another level of seeing these things. To understand these processes we need only identify the idea that matter is composed of descrete units, which could be atoms, molecules etc. The motion of these units and there collisions and interactions with each other can explain everything. But working out problems in such detail will be quite tedious and inefficient. It may be on this ground, arouse those statistical methods in thermodynamics. 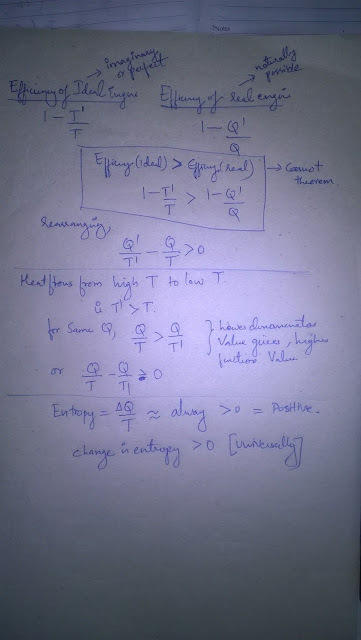 Consepts of entropy and heat flow are just simplification of "Interactions of Uncountable number of Units". If we put 10 atom in outerspace, it won't take us long to figure out that they will spread out rather than accumulate. 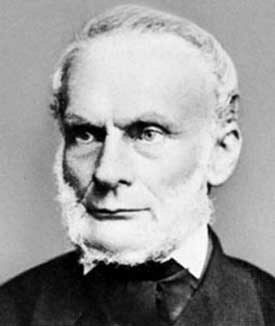 It is that obivious a consept. And this same basic idea underlies the spread of a gas in a vaccum or from a pressurised region to less pressurised region. And ofcourse the consept of irreversibility is a little exagerated, though not too much. Because if we imagine putting 10 atoms in a closed container, entropy may state that they always spreads and make disorder. But no we can see that there is a possiblity that the atoms could all meet at the same time right at the centre (though that takes quite a long while). So does a container full of gas. They could all at a time recede away from the walls, thus making the wall presure less. Since even if this far off possibility ever take place, it will last only a tiny little piece of time that we will never be able to observe it. But still possible! We may not be able to give the physical meaning of Negative temperature,but yet if in an equation,if we get the temperature to be of negative value or if we have to use a negative value to produce the natural symmetric result,then how can we deny that? After all,Ramsay's idea isn't final,may be he have taken the wrong interpretation. After all,Kelvin scale is our convention. We made (kelvin made) it be 270 degree below the zero degree in Celsius scale. It is proved that,there is no temperature below zero kelvin,yet we can't deny the fact that it may be an error. Like the birth of quantum world from classical world. And i am amazed to know the final statement. Possibility of all atoms to reduce the pressure at wall,may be near zero,but never the zero. 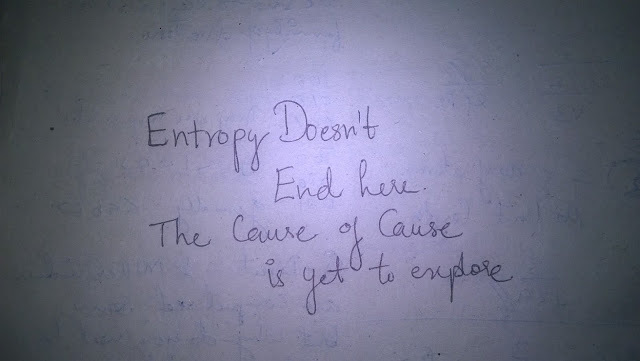 May be,we would have to define entropy in a better way than we have right now.